Every era in art has a new favored subject. The Etruscans looked to Hercules; painters of the Renaissance reenvisioned the Bible; the American Ashcan School rendered sensitive tableaus of poor urban life; and the later half of the 20th century, dominated by the PoMo-ism of downtown NYC, crowned a new king, the cockroach, which was not only an available resource, but a stand-in for the artist—a heroic outcast, thriving in the ruins of civilization. 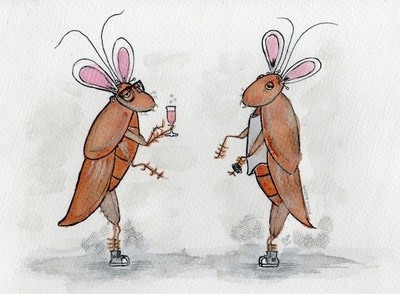 The oeuvre of the cockroach is best understood as a series of distinct ages that, in turn, comprise a whole. During the Reformation, the cockroach was reconsidered; the Enlightenment percieved the cockroach as potentially “divine”; the Golden Age saw the pinnacle of the discipline; the Silver Age was consumed by celebrity; the Bronze Age refigured the subject as metaphor and victim; the Age of Decline represented the subject in absentia and/or in parts. As far as I can tell, no one has completed, or even attempted, to survey the cockroach's place in the art world, so consider this seven-part piece that examines an artistic era that scuttled by so quickly, hardly anyone even noticed it.